Creative photo frames make fun and easy homemade gifts. 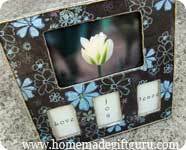 Here you'll find photo frame ideas for all levels of craftiness... some for kids, some geared more toward adults. 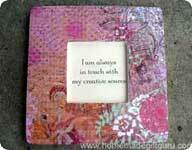 Creative frames are a good choice to make for a variety of occasions. 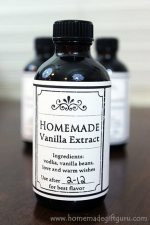 In addition to making for some lovely and inexpensive homemade Christmas gift ideas, they also make thoughtful memorial gifts and super sweet Mother's Day gifts and Father's Day gifts. They can be perfectly customized for your gift recipient and may even become family heirlooms. The ideas here are all very thrifty! In most cases, you can start with a frame that cost a mere dollar or so, like the ones shown above... all from our local dollar store. You can also get great inexpensive photo frames at thrift stores and yard sales or go the Michael's when they are having one of their killer photo frame sales. I've gotten amazing frames for over 60% off or simply on clearance. Don't have a photo frame? Some of these creative photo frame ideas can be made without the use of a frame at all. You can cut out a piece of thick card board in the shape of a photo frame, cover it paint or paper... then embellish it using one of the compatible methods above. 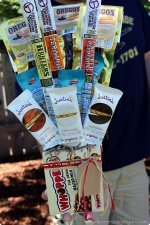 This makes great gift ideas for kids to make too since the cost is minimal. 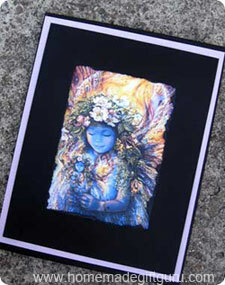 Print favorite photos out or use the images from used cards and post cards... or even frame art work! I share a ton more ideas for what to frame at the bottom of this page. Whatever you decide to frame, you can use the following ideas to help you design customized and creative photo frames for friends and family that they will LOVE! The following creative photo frames start with cheap frames from craft, thrift and dollar stores and are transformed into original creative frames for a variety of occasions, themes and gift ideas. 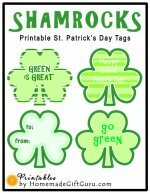 See how easy it is to pick out the perfect patterned paper to match photographs, personality, decor, quotes or pictures. Varnish is then added to give it durability and sheen. See also this inspirational decoupage frame for another spin on this simple decoupage idea, featuring changeable inspirational quotes for day-to-day upliftment. "Flowers and Buttons" Embellished Frame. The first step is to cover the frame in a flower pattern. Here I used a flower patterned paper but you could also use flower stickers, foam flowers or flower shaped stamps. Then place a button in the center of each flower. These buttons are pre-tied with embroidery thread for a warm and crafty look. Got buttons?... Alternatively, you can cover the frame in buttons using craft glue or a glue gun. Cover it, edge it or make a pattern of your choice. Smaller buttons can sometimes look cute on top of larger ones. Rhinestones such as these can be added to the border of a photo frame, made into a design or made to nearly cover the front of a frame. You can use self-adhesive rhinestones or glue them down yourself. This creative photo frame was covered in striped paper first, sealed for durability and then decorated by rhinestones. Foam stickers just keep getting cuter and cuter. Sometimes they're glittery, sometimes detailed and often self-adhesive. You can use foam stickers to easily spruce up a photo frame. Keep it simple like the frame to the right or layer flowers or other shapes all along the edge for instant cuteness. Spray paint or specialty paint might be the perfect choice for the photo frame you want to fix up. Think... brushed nickel, satin nickel, brilliant silver, chrome, gold, antique or crackle. You can also try colors like neon pink, neon green, bright red or black in either brush on or spray paints. If your frame happens to be plastic, you'll be better off with spray paint. Follow the directions on the paint you choose and be prepared to spray paint outdoors on newspaper and give the frame some time to dry and de-fume afterwards. A glitter frame can be made by covering the frame with clear drying glue or modge podge and then sprinkling generously with glitter. Gently shake off excess glitter and allow to dry. Fill in in any light spots or cracks once dry. Alternative... you can use microbeads instead of glitter. You can also make patterns, such as stripes, by taping off select sections at a time for using different colors of glitter. 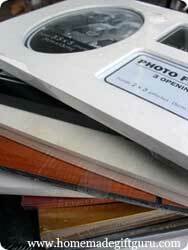 You can also spray with acrylic sealer or triple thick clear coat for longer lasting creative photo frames. You can make tiles or embellishments with polymer clay (I like Sculpey III). You must warm the clay in your hands and knead it well so it is pliable. 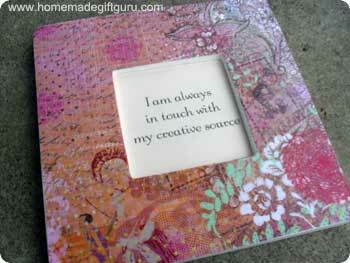 Then roll it out and cut it into tiles with a pizza cutter or craft knife or cut it into shapes freestyle if you like. Bake the pieces as directed on the package and allow to cool. Then glue them onto your frame as you like with the heavy duty glue of your choice (super glue or a hot glue gun work fine for this). Note: If frame is unfinished wood, prepare it first by painting with acrylic paint and allowing to dry. Have you ever seen a greeting card that's machine sewn around the edges? They're really cute! This creative photo frame idea is similar. For a sewn edged look (especially great for baby photos or for nursery decorations), start by cutting your paper to fit the front of the frame. For an unfinished wooden frame, paint with acrylic paint and allow to dry first. Sew the edges of the paper (in about 1/4 inch) making sure to set the tension right for a snug but not too tight thread. Use zig zag or standard. Then glue the paper down to the frame and allow to dry. To prevent wrinkles I usually LIGHTLY mist my paper with water, let it curl and relax, and then glue it down. After everything is dry you may want to spray lightly with acrylic sealer to add durability. You can also cover the frame with fabric. Wash, dry and iron the fabric first. Then cut it to size. Either cut it to fit only the top (frayed edges can be cute) and glue it down, stretching and working out any lumps... or cut the fabric so you can stretch it over the frame and attach in back using glue or a staple gun. The picture shown here came from the reader gallery by Dena. She made meaningful and creative photo frames using the special fabric from her MIL's sewing room to make these beautiful fabric frame memorial gifts. There are many ways to use beads on your frame. One way is to glue them down in patterns (flower, butterfly, spell a name or a word for example). Another is to actually bead some thread either sparsely or fully and wrap the frame with the beaded thread. To keep it in place, add a dab of glue here and there (a tooth pick works great for this, rub it under the thread on the edges or under an occasional bead). Another idea for creative photo frames? Start with a double photo frame... Place the frame face up on newspaper and cover one of the two sides to protect it from spills. Pour plaster in the uncovered side, wiping any spills immediately with a wet cloth. Have your little one make an imprint of his or her hand. After it dries, put a current photo of the baby or child in the other side. This gift will be treasured for years to come. The double frame works as a mold and will be used to hold both the hand print and the photo. Inspirational Quote Frame... I made this for my mom and she loved it! 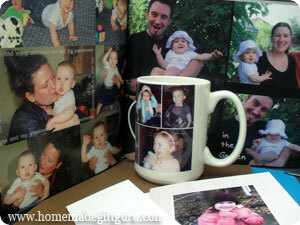 Personalized photo gifts are always a hit... learn more here!